thanks. I love it too. actually the hardware is silver tone s/s. Notice the case is also silver tone, only the bezel is gold tone. bought it from cheapestnatostraps. It is labelled (correctly) as chocolate brown. Very comfy too. soft leather and not too thick. re matching hardware - sometimes it is not necessary. if you look at the top watch with gold case and bezel the hardware is silver and IMO the combo looks very good. Good luck and have fun while you can. Last edited by jackrobinson; January 25th, 2013 at 00:34. Horologic, constantin-o-politan and Redcrow like this. Building up my own set of komandirskies, they're just like pokemon collect them all with those different dials . This is one of my favorites, I really like the blue dial. Horologic, constantin-o-politan, wood and 5 others like this. I don't see this dial very often these days. I bought it a few years ago. Horologic and OCDood like this. I love your watch. You're right they don' t seem to make them new like that anymore. 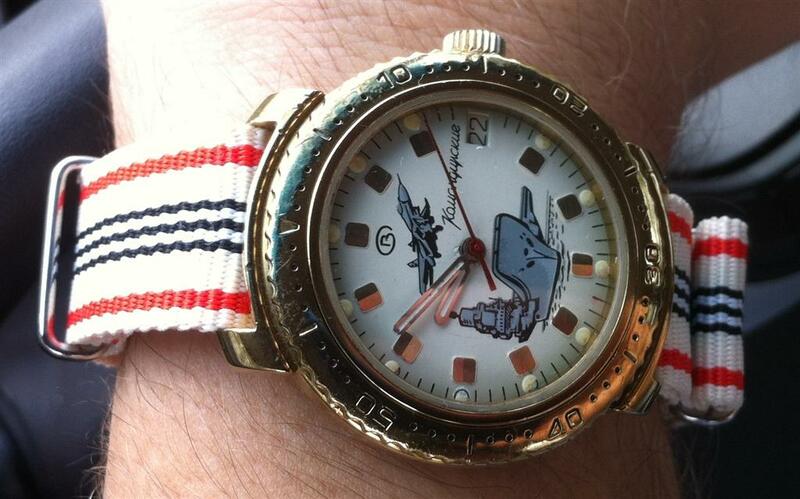 There is a vintage model I want which is very similar to yours, made in CCCP except with a submarine. 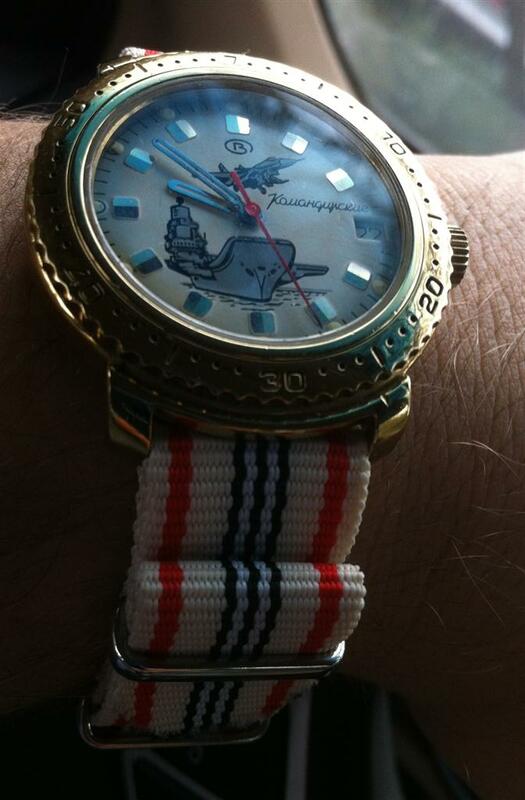 It's got the white dial with red star. I was looking for one on ebay but my options were a couple priced well over $150, and one for only $25 but it wasn't running. I'm keeping my eye out. Last edited by Horologic; January 25th, 2013 at 04:41. Thanks. Perhaps I have the model you are looking for? But sorry, I don't want to let it go at the moment yet. Those white clean dials with a red star are my favorite. Horologic, wood, OCDood and 1 others like this. Another now not often seen model. wood and OCDood like this. A classic 3AKA3 that I picked up a few years ago. 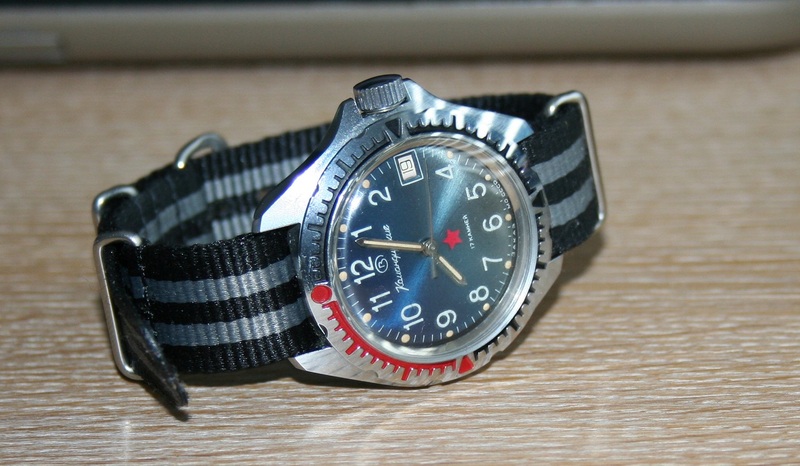 Originally on a regular leather strap but I think it looks better on the bund. Komandirskie with an automatic movement. I actually received this three years ago from Smirs as a replacement for an ordinary 2414A Komandirskie of the same dial that had a bad movement. It's not only a better watch, it's also accurate to within +5 sec/day. I'm apparently not the only fan of this style on here. This one runs at +12/day out of the box. Acquired two years ago from Zenitar. A partial "family portrait" from a few years back, with a classic 2409 Amphibia and a modern 2416 model (before I modded it with a new bezel) thrown in. admiralStojakovic, wood, masterdelgado and 2 others like this. MR Diver, Stone Hill, wood and 4 others like this.